Hello everyone. New member here. Been going over all the posts and reading the wiki docs and checking out VS and it has really sparked my interest. I want to take some of you back to around 1992. (I know a long way away) there was a fantastic game I purchased called Independence War. It was a space simulator game that had a fantastic storyline as well as very well thought out GUI game play interaction. I will give the basic layout of the ship. It was called the Dreadnaught CNV-301. You had 4 stations. Another aspect to this console was the fact you could actually adjust powergrids to put power where you needed them. If your shields were taking a hell of a hit, you would transfer power to the upper shield and lower shield. Of course this would lower your gunners ability to fire, as well as your pilots ability to manover quickly but sometimes It could not be avoided. Pilot seat: - This had forward view as if you were looking out the window of the ship. On the console were various controls. (Formulate with target, match velocity, dock, approach, ect) It had radar display of course as well as the same information readouts showing distance of ships, damage of ships, ect When in this seat, you did one thing, fly and fly good! If you are chasing or evading or just getting through a asteroid field and doing it without taking any damage. So there you have it 4 stations. Now on to what I did with this same concept and then a question. I wrote a game that was on this same concept way back in the day in VB6. But what I did was i split the software into 4 parts. So you had a captains version, eng version, gunner, and pilot. It took 4 people and made them all members of one ship. Each person had to be very good at their job in the game to survive situations. If the engineer isnt doing his job right, it makes life for the pilot and gunner very rough. The game I made was very basic, nothing like the IWAR game but taking the concept one step further to have everyone working as a team. I long abandon the game I made but as of late with some new projects I have been working on professional I got to thinking about this idea again. I do some work with discovery channel from time to time, and can do hardware electronic design as well as a host of other things, and recently have been given the 3d mesh of the Dreadnaught will full perms and would like to take a shot at getting the good old dreadnaught into VS. I will talk more about some of my ideas and where I would like to take them (If possible) but first id like to get some feedback from some out there about what I have described thus far. Thanks for taking the time to read this, look forward to hearing back. That sounds better than time-compressing or reading a book while approaching or leaving jump-points or stations. Then you can see the radar screen. What ships are around you. You can toggle that radar screen to show the ship it self that is on the info display by using the < > keys. Scrolls through the list up or down. Then of course to the left are various autopilot and ship controls. (LDS Drive = "Light speed" Formulate with targeted ship, Follow , Match speed , Approach, Dock. 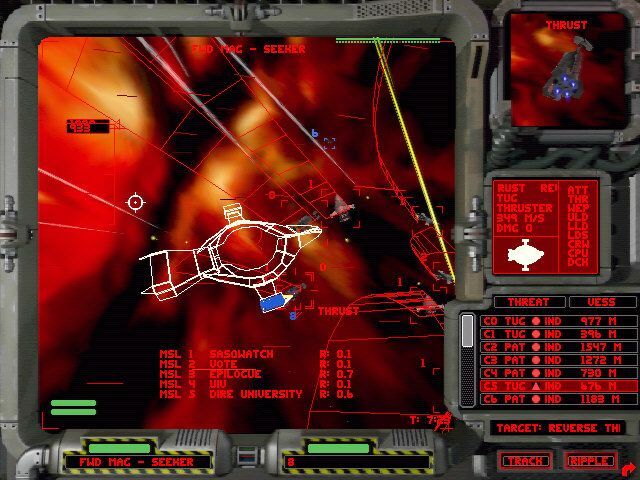 You can see here that the Radar orb is toggled off to display the actual ship that is targeted. It shows on screen there are 5 missiles launched, and the names of the ships they are launched at. The range of the missile to the ship it is fired at, and it displays your ship in wireframe and any other ships around you in full 3rd person view. I wanted to just display these to give anyone that reads my post a bit of a view of what I have in mind. In the game that I made years ago, it was much like what you see here. The great thing about it was, the main server (multiplayer) You had one guy sitting in Texas that was at the pilot chair. And another guy up in Canada sitting at the gunners chair, Another in Florida at the engineers station and me in Chicago at the captains chair. If the pilot pitched to face a incomming ship, all our screens would display the direction he moved us to. If the gunner fired at that incoming ship we would all see the particle beam fire out at it. If the engineer put more power to weapons or more power to thrusters the person at each station would feel the effects. Was really fun knowing that 8 people, 4 in our ship 4 in the enemy ship were all working together to control only 2 ships. There were other aspects of the unit as well. The shields would have a cycle frequency. The engineer could set the cycle rate on the shields and the particle beam weapons. So when you encountered a ship you could spend 4 min firing away to weaken their shields, or a really good engineer could scan the enemy ship and try to judge the enemies cycle rate, then set your ships weapons to the same cycle rate, and it would slice right through the enemy shields and disable them in a hurry. This was not easy to do, because shields could be tweeked. But in a heavy battle it made for some interesting collaboration. Anyway back to what I am trying to do with VS as of right now. I am trying to strip it all back, Redesign the cockpit view. Once I have just the cockpit view redesigned I will work on getting a couple of the corvettes in to the game. I have the mesh, and the green light from the maker to use it as much as I want. Once those two things are done, I will take a look at the star systems. Looking at how to start with Sol, and work out from there. It is alot of work, and I am really not sure of exactly how all of this is to be done. I do know it can be done, and what and how things need to be tweeked to get it this way. Just need to figure out some of the more complex parts of doing it. But for now, I will just go with a basic cockpit overhaul. If anyone out there find any of this interesting, and would like to lend a hand. I am all for it. If enough people want to get involved into this. I will put several resources together for support. I am willing to spend the needed money on this project. I cant pay people for their time, but I can spend on other things to make it all come together. Ok, back to building ships. All the PNG files I try to view to get an understanding of what is what and how to edit them is impossible at this point for me. Every time I try to open up any of the PNG or even the JPG images it comes back with a "Not a valid PNG file". I am using Photoshop cs5 but still nothing. Last edited by gonzo on Thu Feb 14, 2013 11:32 am, edited 1 time in total. Thanks for that Gonzo. That was helpful. Here is an update of what I have done so far. I have started working on the 3d bridge layout. One of the things I needed to do is make up some charters. Figured I would start with a male and female. These charters will sit at stations. (IE : Gunner , pilot, engineering ) When you look around the bridge you will see them sitting at the consoles. And during missions, when interaction is needed between you and the crew these are two of the faces you will see. Lets start with the pilot. Class : Lt Commander / Pilot. Joined the commonwealth navy after a pirate faction killed her family leaving her a widow and the loss of her daughter in the freighter attack by the pirates. Joined the commonwealth navy after serving time in prison for weapons manufacturing and smuggling. Son of wealthy arms dealer Jax Ventu. Still have a very long way to go. Getting around some learning curves on some things but thought I would just put this out there to see what others think so far. Well I am pretty stoked about todays results. I got the ship and all of its controls programmed up today. Still need some finishing on some of the details but here she is in her glory. Most of the inside of the ship is finished as well. Will be perfect for doing game videos for scenes. Also another element I am adding to this is you are able to walk around in the ship as well as board other ships when docked. Sen wrote: I want to take some of you back to around 1992. (I know a long way away) there was a fantastic game I purchased called Independence War. It was a space simulator game that had a fantastic storyline as well as very well thought out GUI game play interaction. I will give the basic layout of the ship. It was called the Dreadnaught CNV-301. You had 4 stations. Much the same had e.g. Alien Legacy, but with less simulator part and more strategy part. This one is an interesting example - already a simulator. Yeah, pretty much the only way to use a lot of controls and data. I see base screens (there's already "simulate_while_docked" option, btw) as a precursor for such controls. Though there's a need for some unified interface eventually subsuming most of the functions currently split between in-flight Nav Computer pad and base screens. Especially to run launchable vehicles such as interceptors (have a repair bot, outfit and repair them in bays just like a player's ship on bases) and shuttles (there's already a transfer screen, for trading). Again, it would make more sense if there won't be a need to "land" capships all the time, but commands like "send a shuttle to sell X and buy Y", "mount purchased missiles" and "send a bot to patch armor", while obviously implementable, need more of an interface. Looks incredible Sen. Look forward to seeing more!